McDonald’s stated overall approach to responsible use of antibiotics focuses on refining their selection and administration and reducing their use. They express the desire to ultimately replace antibiotics with long-term solutions to prevent diseases and protect animal health and welfare. McDonald’s recognizes the need to treat animals when necessary. Not to be outdone, Wendy’s came out with a new policy of their own relating to sustainability initiatives. Wendy’s announced that they have partnered with the Progressive Beef program that focuses on best practices and third-party verification. This program will be implemented in a significant part of the Wendy’s beef supply starting in 2019 and it is expected to be adopted with at least 50% of the supply in 2021. Cattle care: Providing a safe, humane environment for cattle through staff training on management practices and hands-on veterinary care. Food safety and antibiotic use: Responsibly using antibiotics under the supervision of a veterinarian and with thorough record-keeping, strictly adhering to withdrawal times, utilizing HACCP principles and ensuring a clean and safe environment for the animals. Environmental sustainability: Responsibly utilizing natural resources while investing in the people who care for the cattle and the local communities through staff training and certification. These announcements by McDonald’s and Wendy’s are the latest examples of external influences placed upon the livestock industry and in particular the beef industry. You may recall that as of January 1, 2017, the Food and Drug Administration requires that all medically important antibiotics to be used in feed or water for food animal species require a Veterinary Feed Directive (VFD) or a prescription. The Beef Quality Assurance (BQA) program certainly impacted the beef industry in 2018. Wendy’s previously established a goal to source 100% of its beef from BQA certified sources and reached that goal a year ahead of schedule in 2018. Wendy’s stance on BQA prompted the packers Cargill, National, and Tyson to require sourcing a large percentage or all of their fed cattle supply from BQA-certified feedyards beginning Jan. 1, 2019. Beef producers in Ohio responded to these corporate decisions as evidenced by over 4,000 individuals obtaining their BQA certification thus far in 2018. 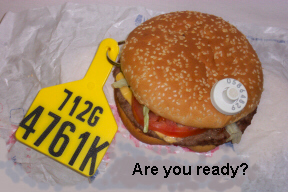 Societal pressures are placing a growing list of demands on the beef industry. Consumers of beef expect us to judiciously use our natural resources, protect the environment, and deliver a safe, wholesome product that tastes great. These demands start at the retail sales level and work their way through the entire supply chain until it ultimately reaches the producer on the farm. The U.S. beef industry is the most efficient producer of high quality beef in the world. However, we must be honest enough with ourselves to recognize that there is always room for improvement in how we conduct our business. I realize beef producers have had a wide variety of reactions to outside influences that impact how they are expected to manage cattle and produce beef. Emotions have ranged from anger to skepticism to confusion to acceptance. We cannot afford the luxury of assuming these societal demands are a temporary fad. Change is a reality and we should be proactive in dealing with the situation. Individuals and cattle organizations should work with the industry infrastructure and consumers alike to bridge knowledge gaps and find workable solutions to consumer concerns. Simply having the best PRODUCT is not enough. Merely telling the best STORY is not enough. Delivering great CUSTOMER SATISFACTION is not enough. They pointed out that the Certified Angus Beef brand’s success moving forward will continue to come down to their effectiveness in elevating consumer TRUST. This is sound advice that can benefit all aspects of the beef industry! Posted by Smith at 5:16am December 19, 2018 Posted in Economics, Management, Quality Assurance. Bookmark the permalink.